We are closely monitoring a couple of areas in the tropics that have a potential for development over the next 48-72 hours. 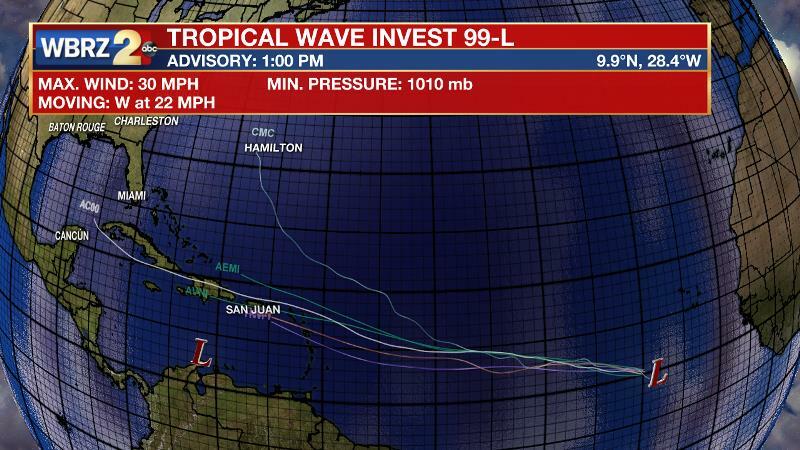 The first area is called INVEST 99L and is located a few hundred miles southwest of the Cape Verde Islands off the coast of west Africa. The system is currently producing a disorganized area of showers and thunderstorms that could potentially become better organized over the next few days as conditions become more conducive for development in this area. The National Hurricane Center in Miami has assigned a 50% of formation through the next 48 hours and an 80% chance through 5 days. A tropical depression will likely form by the middle to early part of next week and continue to move west-northwest at 15-20 mph across the Atlantic ocean. This system still has a long way to travel across the Atlantic Ocean and there is no immediate threat to the U.S. mainland at this point. See graphics below for further information. 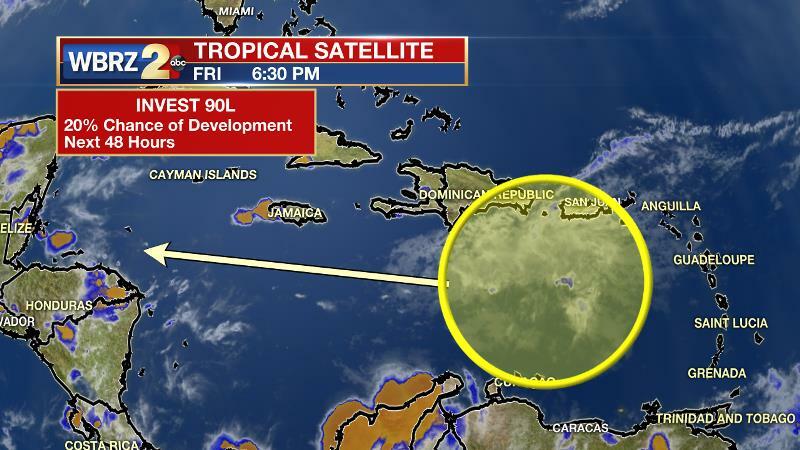 The second area of tropical development is currently located in the central Caribbean just to the west of the Winward Islands. 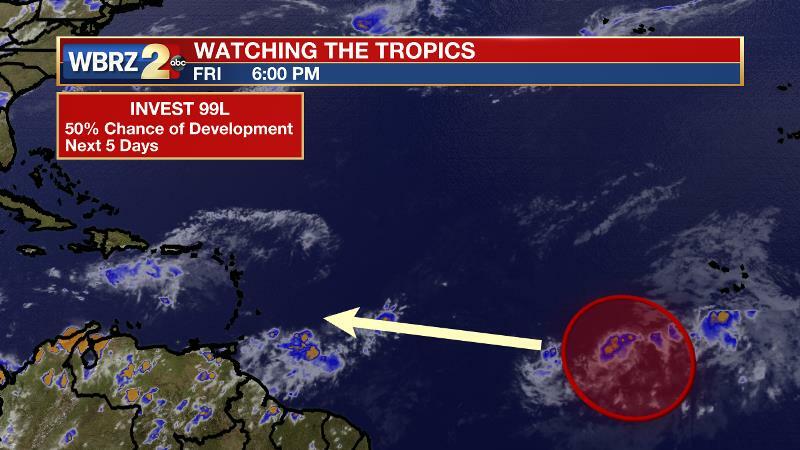 Development of this tropical wave is forecast to be slow over the next few days and has a 20% chance of formation over the next 48 hours and an 80% chance during the next 5 days. 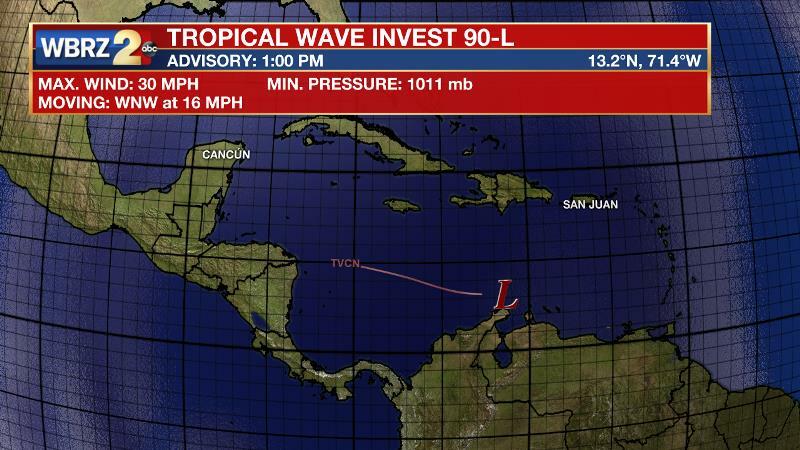 It expected to continue to move west-northwest around 15 mph across the western Caribbean, and potentially move near the Yucatan Peninsula and Bay of Campeche early next week where conditions appear more conducive for development. This system is not likely to pose a threat to Gulf Coastal areas of the U.S. due to its westward movement. 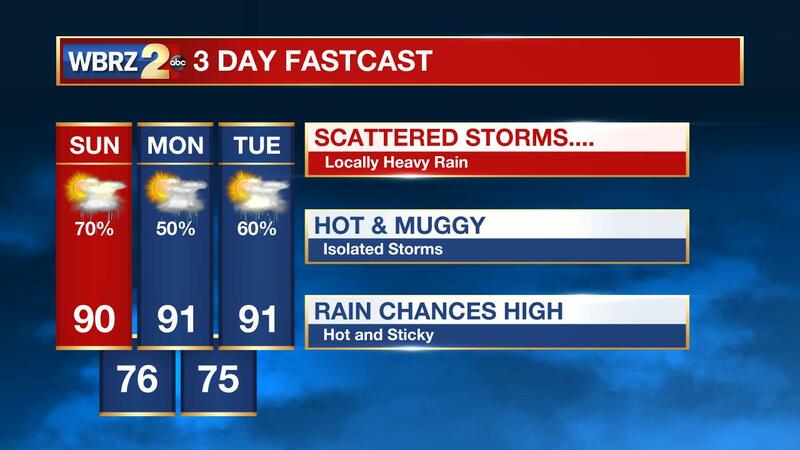 Rain Chances Still Threaten for the Weekend. 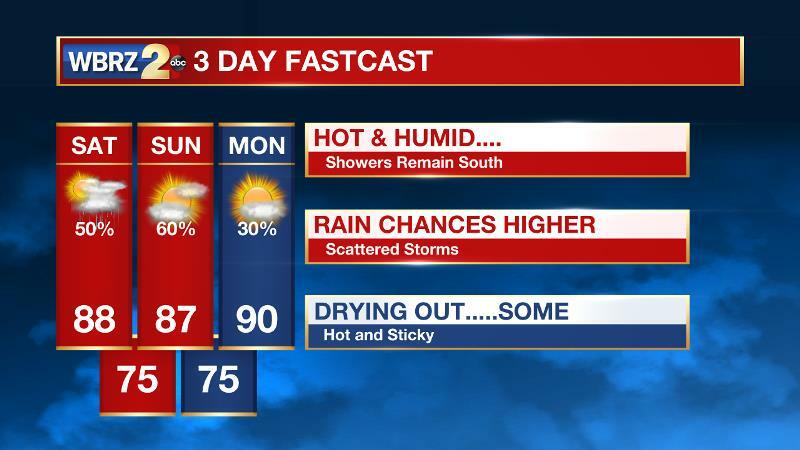 While the heat and humidity will no doubt continue, the chance for rain on Saturday stands around 50% with much of this activity remaining along coastal LA. The focus of this showers and thunderstorm activity is an old cold front that has washed out and evolved into a trough of low pressure that is meandering along the Gulf Coast from Texas to Florida. While this old boundary should remain well to our south, we could still potentially experience a few renegade thunderstorms that creep up from the south. It appears although that much of Saturday will hang on to the dry side of the forecast, so make your outdoor plans, but carry the umbrella just in case Mother Nature isn't in total agreement with our assessment of the forecast. Rain chances will be on the increase as the aforementioned trough will move even closer to our area. We will up the chance of rain to 60% with most of the activity occurring after the noon time hour. High temps will range in the upper 80s with oppressive heat and humidity continuing to bear down on the southeast.